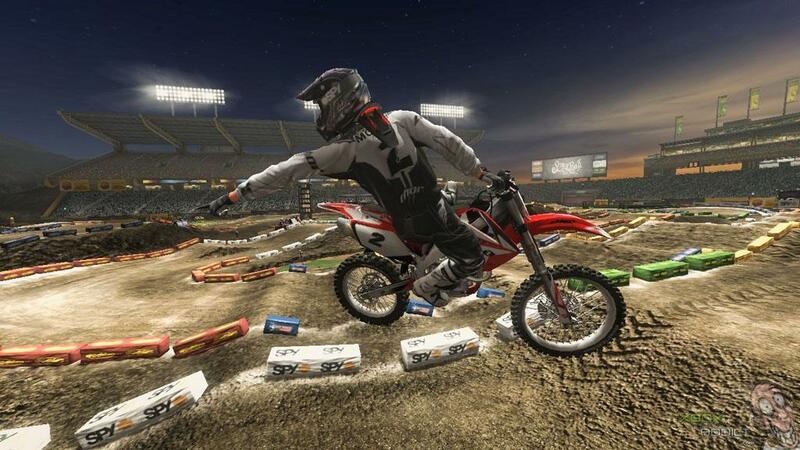 Under bright lights and a jeering crowd, we rev our engines and review Nordic Games’ MX vs. ATV: Supercross. Come see what we thought! While lengthy RPGs and fast-paced shooters dominate the AAA market, racing titles of all sorts always seem to nibble at the leftover scraps. This is, in part, due to the fact that these games are truly only played by a small group of real fans and you when extended family is over during the holidays. To that end, there will always be a living, albeit small, market for the numerous car, boat, and dirigible racing games that seem to reproduce every year, but most of these projects lose their form and reshape into the familiar, gelatinous mold that is the racing template. Unfortunately, while it does maintain a steady rhythm, MX vs. ATV: Supercross does exactly that and fails to be anything more than just another racer for reasons that have plagued the genre since its birth. 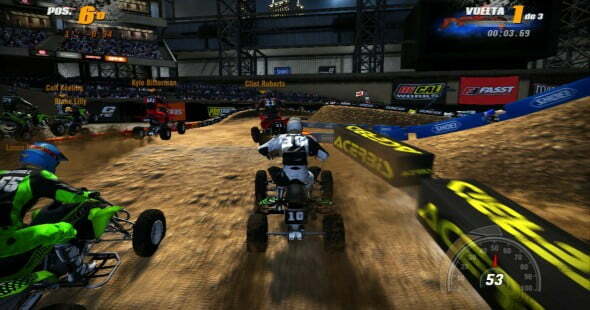 Sixth in the series but the first to be published by Nordic Games (after THQ filed for bankruptcy), Supercross strives to live up to a franchise that has, in previous titles, allowed golf carts, helicopters, and monster trucks to race against motorcycles and ATVs. Sadly, while the imagination could be stretched with these wacky combinations of crafts careening through a course, Supercross lacks anything exotic and sticks to what’s implied by the title. Which begs the question as to why two completely different sports are being mixed together in the first place. For those of you who have never had the pleasure of trying to control either or both of these kinds of vehicles, trust me when I say the difference is akin to parallel parking a cruise ship and a scooter. ATVs are sturdier and require less balance, but motorcycles turn on a dime and can be manipulated in the air more easily (we’re talking about the game now), so pairing the two and and telling them to kiss (race) makes about as much sense as pitting Manny Pacquiao against the Oakland Raiders in a game of basketball. Previous MX vs. ATV titles could at least claim they were being wacky, what with racing a motorcycle with a golf cart, but Supercross seems to try and take itself seriously, to an end none of us seem to understand. Like most racing games, there were a few different ways to drive around in circles. I could race circuits like a grownup, play with friends online, or free ride any of the tracks I had unlocked through previous play. Being the type of guy to leave no stone unturned, I decided to run through a couple of the circuits and give the AI a whooping. It wasn’t long till I stumbled upon one of the biggest crutches (besides being boring) that racing games still stagger from; patronizing AI. You see, I’m the kind of guy whose first instinct on a track is to see how far I can get while driving in the opposite direction before the game resets me, simply because, again, I’m that guy. This obviously puts me into last place, so of course I’ve got some catching up to do. What I hadn’t (but should have) expected was that, upon realizing I was a mile and a half behind everyone, the game decided to make sure each and every bot player’s motorcycle either became familiar with the side railing or somehow shifted into negative gear till I caught up and took first place. It’s this kind of handholding that upsets me. I’m a grown man, let me face the consequences of my actions and beat the ever-living tar out of me, don’t hobble everyone else because I can’t bother to take the race seriously. Having risen the ranks of paint-sniffing AI racers and taken gold in my first circuit, I decided to check out multiplayer. Upon joining a party mid-race, I was forced to spend the better part of seven minutes watching everyone else have fun while I just sat there watching like the creep at your local park. Once they’d had enough, I was brought in and a new race started. Instead, however, of meeting a challenge that wouldn’t do everything in its power to make sure I won, I was instead greeted by a bunch of people doing donuts, hurling into one another, and running the track in reverse. It was fun to join in, sure, but I came here to race, not see how many ATVs I could stack against the finish line towers. Out of all the different gameplay modes, Free Ride was probably the most entertaining, possibly because there was no one there and I could wallow in my loneliness without fear of actually accomplishing anything. 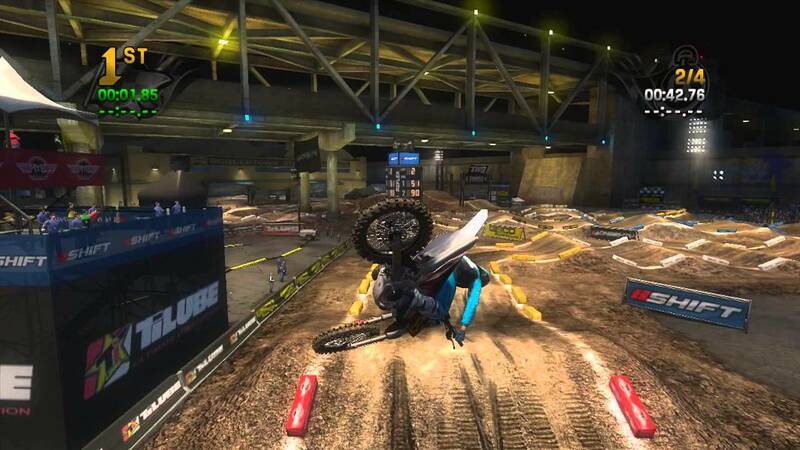 The graphics are nothing to write home about, the tracks all look the same (regardless of it being in Anaheim or Miami), and the soundtrack is EXACTLY what you’d expect, pumping out Nickelback knock offs and Rise Against angst anthems with the same vigor as Tony Hawk Pro Skater. Another monkey wrench in the barely-oiled machine that is the racing genre is the blatant abundance of advertising stuffed onto every flat surface, and Supercross is absolutely no exception. Boasting bikes, gear, and literal advertisements on the tracks for eighty motorcycle and energy drink companies, the game basically plays as an interactive commercial. While having virtual versions of real vehicles makes sense in any racing game, I’m not quite sure why I’d need Red Bull’s official goggles or KTM’s helmet, surely none of these trinkets make me any faster on the track. The whole experience just comes off as tacky. Those of you who bought the game don’t deserve to be upset when you end up underwhelmed, first because you bought a racing game and expected gold, and second because you bought the sixth installment in a series that has repeated itself more times than Family Guy. 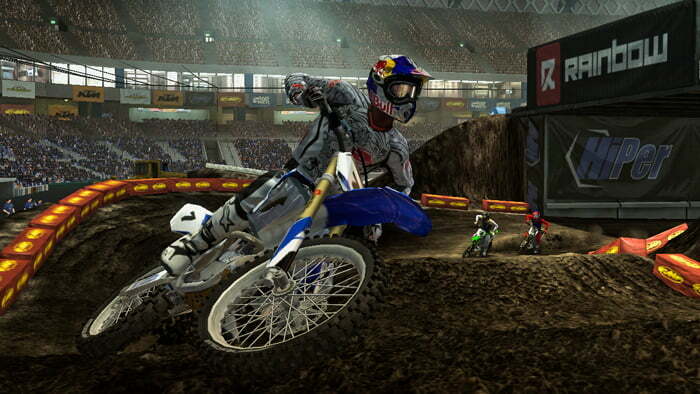 The goofy, redeeming qualities in the first couple MX vs. ATV games died out when they decided to put on their serious face, so you’re left with a copy paste of any and every racing game ever. Needlessly generous AI, in-your-face advertising, and controls that cause your rider to seize like an epileptic if you so much as sneeze all contribute to the last place trophy winner that is Supercross. And while it runs seamlessly without major crashes or bugs, perhaps Darksiders 3 would’ve been the best choice for Nordic Games’ attention. Continuing on the THQ legacy under Nordic Games, we see the revival of the MX vs. ATV series with MX vs. ATV: Supercross. While it runs smooth and allows for a few minutes of entertaining free ride, the game falls victim to hand-holding AI, oversensitive controls, and overzealous advertisements. Sure, it runs, but that's no excuse for you to sit down and give it the time of day.